Unlike any pet house you have seen before. Pet Tree House. Let your curious cats climb 6 feet high on this hand-crafted luxury Tree House. This Tree House is custom made making it one of a kind. 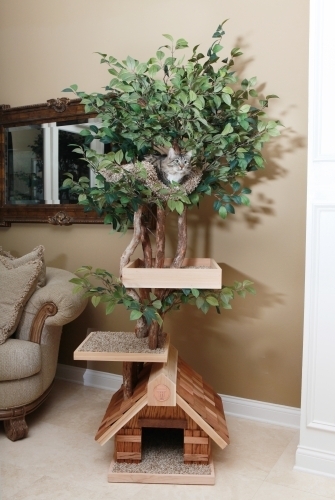 The Adult (medium) Tree House is perfect for multiple cats or your special cat that likes to explore. 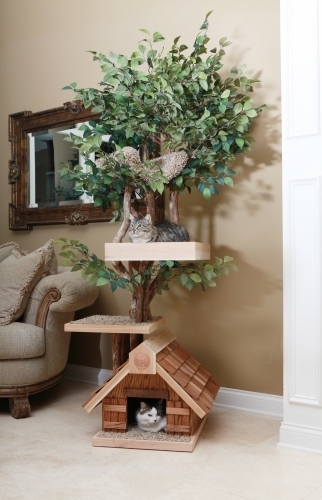 Pet Tree Houses gives your cats the room to play, jump, explore and sleep. Crafted of wood, cedar, plush carpeting and synthetic silk leaves, this house brings out the kitten in you cat. It features removable carpet for ease of care. * Movement, rustling and flexibility when you cat climbs; brings out their natural animal instinct of curiosity. Not only is Tree House a durable interactive play center for your felines, it is stylish and beautifully constructed blending in with your home. 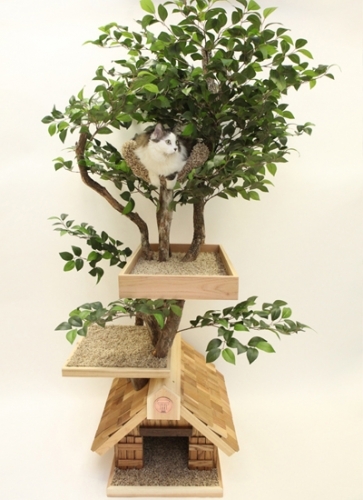 This tree will bring out the true nature of your cats! Visit the Upgrades Tab to add additional items to your tree such as extra branches, extra foliage, and paw ports! Shipping $165.00 in the 48 contiguous United States. Ugrade to White Glove Delivery for only $50 extra. Visit the Upgrade tab to add this to your order. Please call for shipping quote to Canada or email your complete shipping address. Currenty, we do not ship internationally other than to Canada. Medium House w/square entry door 28" x 19" x 19"